With winter just around the corner now is the time to plan your late holiday for 2015. P&O Ferries’ Hull to Rotterdam will keep your spirits lifted as the cold weather descends – take a look at our guide to vacationing in Holland this year. The festival season my be drawing to close but there’s always a party somewhere in the Netherlands. This year the Dutch have been celebrating the life of their most famous artist Vincent Van Gogh to commemorate the 125th year since his death. Though we now approach the dying months of the year there are still plenty of events left for you to attend in order to pay tribute to one of the grand masters of the art world. Witness the last bit of floral grandure for 2015 at Keukenhoff’s renowned flower gardens. This year’s theme is Van Gogh’s 125 years of inspiration. The last of the dutch tulips for the season can still be beheld, arrangements inspired by the Vincent’s impressionistic style melding motion with emotion, bright colours meshing the vibrancy of life with the sorrow of its inevitable decline. One of the most iconic Van Gogh pieces Sunflowers has been re-envisioned with the Dutch nations favourite flower the tulip. For that last glimmer of lush plant life before the barren winter you would do well to visit the gardens of Appeltern. 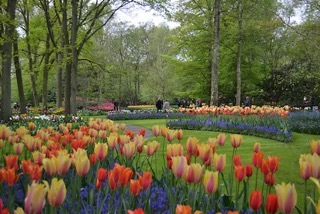 This is one of the biggest open gardens in Holland it has been open to the public since April but now is your last chance to get a look around before they close up for the off season. There are over 200 model gardens on display, you’ll need more than a single day to fully appreciate them all but it would be a grand idea to look about for ideas for the coming spring. Appeltern is a great venue to bring the kids, especially if you want to encourage them to have green fingers, there’s also a hedge maze, gnome path and treehouse to explore. If you take your plant life seriously then the Whisper Tour, sign posts and audio recordings, allows you to find out all about the plants and offer you tips on how to grow them as well as navigate the expansive park. As part of this year’s tribute to Van Gogh 10 garden designs have been specially arranged to commemorate the artist and his work after being specially selected from dozens of landscape architects. Appleton is due east of Rotterdam and just short from the country’s capital Amsterdam. The final flower celebration of Van Gogh may is a little sooner than you’d think. If you’re trip to Holland is just around the corner then be sure to keep an eye out for the Zundert Flower Parade. The town of Zundert is near Antwerp, the hamlets there each try to build the best float and parade them through the streets. This year’s parade is on September 6, traditionally it is done on the first Sunday of September. Naturally the parade is Van Gogh themed, the whole of Zundert tends to make an appearance for the event and they pull out all the stops to be the very best of hosts with live entertainment and food and drink aplenty. Our next event is set right in the heart of Holland, a bit of a drive but well worth it. The Eindhoven light festival GLOW is set to start on November 7th running for the entire seven day week. The city centre truly comes aglow this winter, as the days become shorter you’ll find that night becomes all the more vibrant. If you’re spending time in Holland this winter we can’t recommend highly enough that you take advantage of the winter light installations. For night time strolls they really can’t be beat, you’ll get to see the transformation of casual street during the day to an ethereal faery like place. The light displays are dreamed up by artisans from across the globe and they’re designed to really evoke a sense wonder at the urban world we live in. Each year GLOW is given a theme for its light displays and this year’s is, you guessed it, Vincent Van Gogh. So you know the designers behind these displays will have done there best to take you on a journey as you explore Eindhoven under the magnificent lights of GLOW. If you can’t be in Holland for GLOW then don’t despair at the end of November from the 27th right through to February 2016 Amsterdam is holding its own Light Festival. Each year The old canals and rivers of Amsterdam are decorated with more than your casual christmas fairy lights. Light engineers and artists cooperate to transform the city each night in to a wondrous a plane of the imagination. 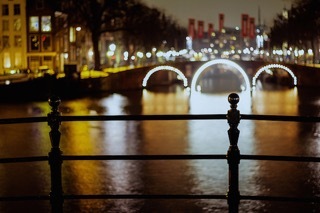 These installations, as with the GLOW festival, make for memorable romantic twilight and midnight walks, you will want to be hand in hand with your loved ones strolling through the streets of Amsterdam to really make the most of this event. As a canal riven city Amsterdam offers boat tours at night so that you can drift by the installations and admire the craftsmanship and imagination that has gone in to making them. The crossing from Hull to Rotterdam for you cultural tour of Holland is open for bookings, why delay?